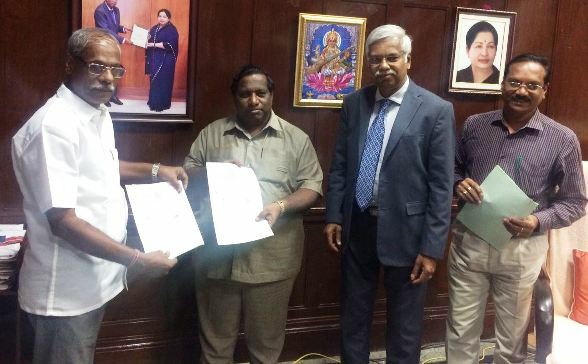 Annamalai University established MoU with CITEP to conduct unique one year PG Diploma in “Export Management and Entrepreneurship” through hybrid mode. Annamalai University, the only unitary, residential, multi-faculty University in the State of Tamil Nadu accredited with ‘A’ Grade by NAAC on recently established a Memorandum of Understanding with Centre for Indian Trade and Export Promotion (CITEP), a Not for Profit incorporated Organisation to promote trade, industry, agriculture and exports to conduct one year Post Graduate Diploma in “Export Management and Entrepreneurship” through hybrid mode. The Centre is also providing a host of self-employment opportunities. Signing of MoU: from L to R – R. Asokan, Executive Director, CITEP, Prof.Dr. K. Arumugam, Registrar, Prof.Dr. S. Manian, Vice Chancellor and Prof.Dr.K.Manivannan, Director (Academic Affairs) Annamalai University. In the Dais: from L to R - Shri A. Sriram, Director (Trade Promotion), Shri Harishmohan, Deputy Director (Team Coordination), Shri M.S.S. Ravi, Member, Board of Studies, Shri R. Asokan, Executive Director from CITEP and Prof.Dr. K. Arumugam, Registrar,Prof.Dr. S. Manian, Vice-Chancellor, Prof.Dr. K. Manivannan, Director (Academic Affairs) from Annamalai University.